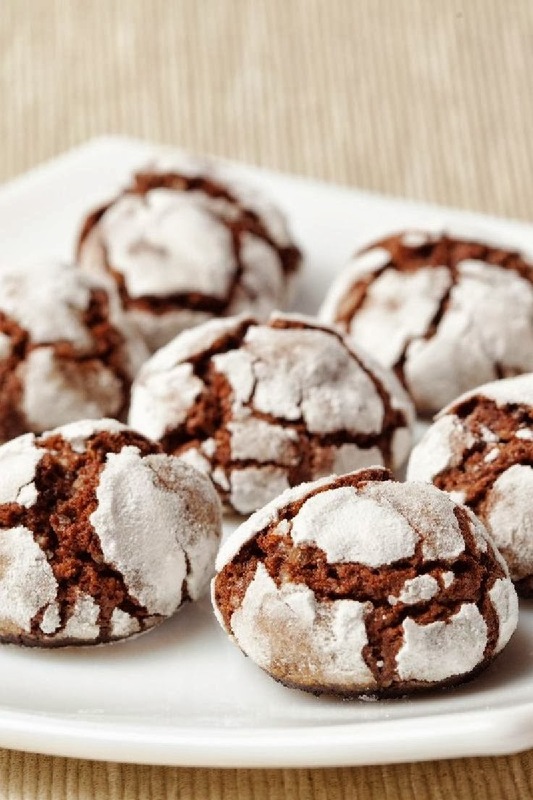 These are chewy, fudgy, SUPER EASY cookies that you can probably make right now! I have watched these disappear time and again and everyone is always asking for the recipe. It is almost embarrassing to give it out, it is that easy :) Enjoy! Dust hands with confectioners' sugar and shape dough into 1" balls. I have tried these with several different cake mix brands. They all come out good, but the Betty Crocker does come out the best. I was having a problem with my cookies flattening while baking. This usually happens with the generic cake mix brands. You can play with your oven temp and try them on 375 to keep them from spreading. Adding more oil than called for will also cause the cookies to spread -- I wouldn't suggest it, they really don't need extra oil. Another way to keep them nice and thick and to get the most 'crinkled' or 'crackled' look is to make them bigger. When I roll them at about 1.5 inches they look prettier. And my best tip: My confectioners' sugar was consistently being absorbed by the dough. The last time I baked them, I rolled them into balls without rolling in the sugar and let them 'dry' for a few minutes. Then I rolled them in sugar and baked. These came out with a nice coating of sugar that didn't disappear.